1. Wash and sort beans. Put in a large bowl with 12 cups of water. Cover and soak 8-12 hours in the refrigerator. 2. Thoroughly drain the soaked beans. Place beans and 6 cups fresh water in slow cooker. 3. Add the carrots, celery, onion, tomatoes, bouillon, sugar, vinegar, garlic, oregano, chili powder, and pepper. Cover and cook on high for 8 hours. 4. If using long grain brown rice, stir it into the bean mixture about one hour before soup should be done. If using instant brown rice, stir it into the soup about 20 minutes before soup should be done. *This soup can be frozen and saved for later. 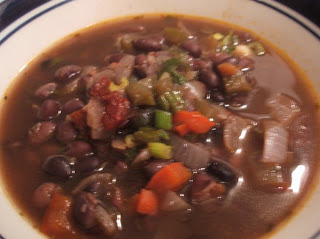 *For Black Bean Burritos take 4 cups of Black Bean Soup and fill 8 tortillas with 1/2 c. of soup. Top with 1/4 shredded cheddar cheese and wrap up tortilla. These can be frozen for later. To use right away, wrap each burrito in foil and bake at 350 for 10 minutes. Remove foil and bake 5 more minutes. These can also be microwaved for 2 to 3 minutes until heated through.